I have a big basket full of old blue jeans. Many of them have been cut and torn, some by the kids and some by me for craft projects such as this one. This uses a very small amount, but I thought it was fun and actually I really like the way it looks! 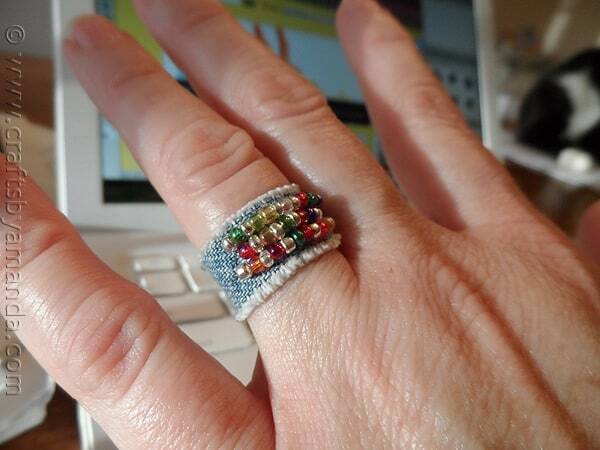 Would be pretty cool enlarged into bracelet size too, but for now we’ll go over how to make this denim beaded ring. Seed beads are tiny and can be a bit difficult to work with. My advice is to leave them in a plastic bag and poke your cord or needle into the bag to pick up the beads. That’s a much easier method than trying to pick them up and thread them on individually. This ring is really easy. 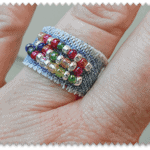 Fray a strip of denim and sew on some seed beads. That’s pretty much it! 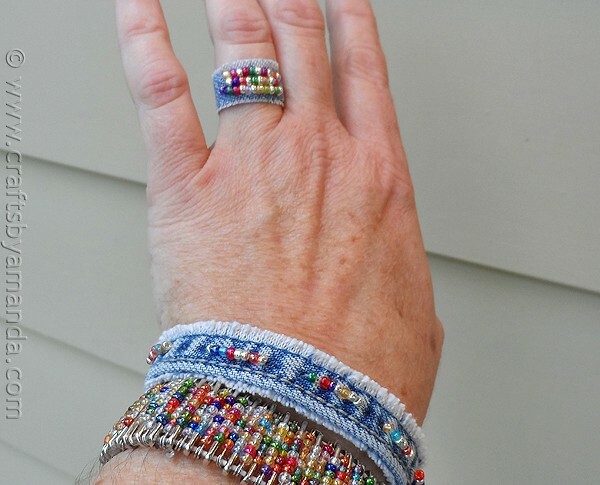 If you like the bracelets that are pictured, you can find the tutorials for those here – Recycled Denim Beaded Bracelets and Safety Pin Bracelet. 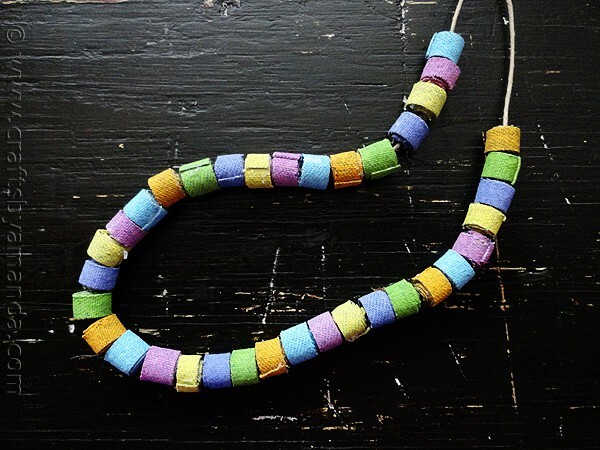 If you need another wearable idea for recycling denim, how about these colorful recycled denim beads? The printable instructions are below, have fun! Iron the denim strip to remove any creases or wrinkles. Trim to the width you want your ring to be. Fray the edges of the denim strip by pulling strands of the denim off one at a time. Thread the needle with stretchy jewelry cord and knot the end. Poke the needle through the center of the denim and pull until the knot touches the back of the denim. Use the tip of the needle to pick up the seed beads. Push the seed beads down the needle past the eye and onto the cord. Push the beads all the way down until the reach the denim. Keeping the beads together, lay them down onto the denim to gauge where to insert your needle. Run the needle through the denim then back up through again and repeat for a second row and finally a third row. Tie off the cord at the back and secure with a small amount of hot glue. 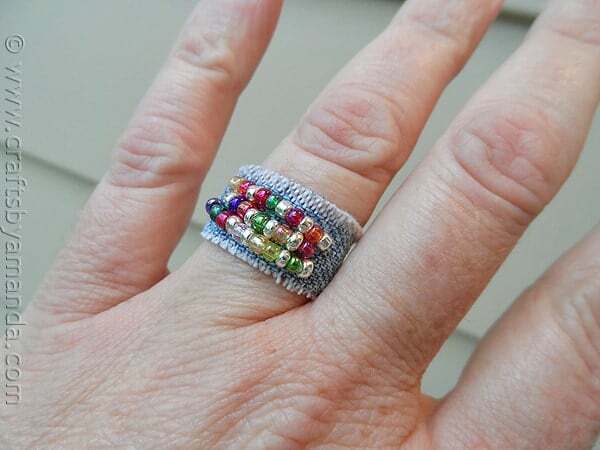 Wrap the denim strip around your finger to gauge the size. Trim, allowing a little excess so you have room to glue the ends together. Use hot glue to secure the ends creating your ring. This is so cute and seems very easy to do. I’m thinking of making some for the Escalante Canyons Arts Festival coming up on Sept. 28-29. Maybe you could come??? What fun that would be! It’s a bit too far away from Wisconsin though. Looks like a great time! aaw this is cute and lovely. i love your work and i’m most at the time by your work inspired. I love t he way how you recyle old materials. I also recycle old material so some idea’s are helping me to make some stepsforwards.